Our CSA members received GIANT heads of romaine lettuce in this past weeks share. The lettuce at Tumbleweed Farm is doing exceptional this season. It’s our main wholesale crop and we supply restaurants in the area with our loose leaf lettuce all season long. And while I love fresh greens tossed in a simple vinaigrette I’m really loving throwing whole heads of lettuce straight onto the grill. 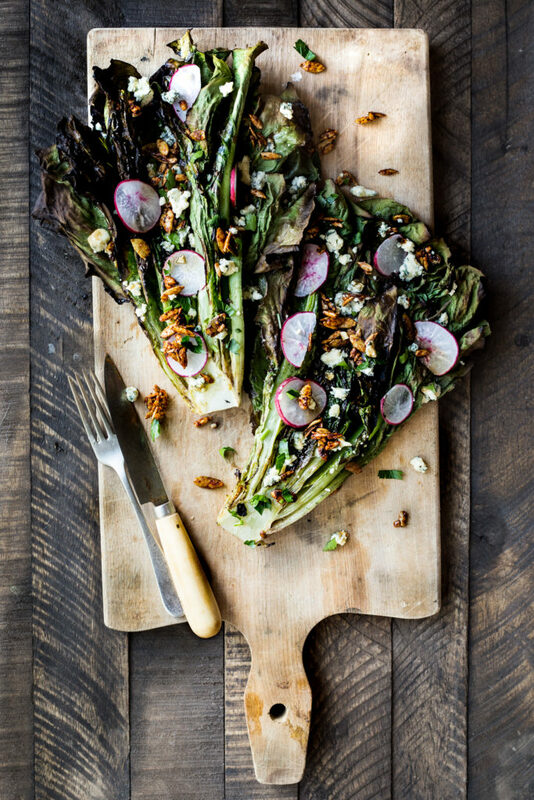 This charred romain is dressed in a simple balsamic dressing and loaded with smokey seed clusters, blue cheese crumbles (from our favorite cheese maker!) thinly sliced radishes and minced parsley. Simple, delicious and filling to boot! The smoky seed clusters get their bold flavor from smoked paprika and are lightly sweetened with a touch of pure cane sugar They are addicting and a great addition to any salad, pasta dish, grain bowl, or even toast. I hope you all love this tasty salad as much as we do. Cheers from Tumbleweed Farm! Holy cow these seed clusters are amazing! Prepped them for dinner tonight and I’ve eaten half already! Hope the rest lasts until the family gets home. Delicious recipe as always- love your site!